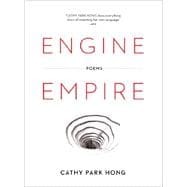 Engine Empire is a trilogy of lyric and narrative poems that evoke an array of genres and voices, from Western ballads to sonnets about industrialized China to fragmented lyric poems set in the future. Through three distinct yet interconnected sequences, Cathy Park Hong explores the collective consciousness of fictionalized boomtowns in order to explore the myth of prosperity. The first sequence, called "Ballad of Our Jim," draws inspiration from the Old West and follows a band of outlaw fortune seekers who travel to a California mining town during the 1800s. In the second sequence, "Shangdu, My Artful Boomtown!" a fictional industrialized boomtown draws its inspiration from present-day Shenzhen, China. The third and last section, "The World Cloud," is set in the far future and tracks how individual consciousness breaks up when everything-books, our private memories-becomes immediately accessible data. One of our most startlingly original poets, Hong draws together individual voices at odds with the world, voices that sing their wonder and terror.